Some parts of Pennsylvania may experience below-freezing temperatures. With winter weather comes the increased risk of being involved in a car accident. Fortunately, there are steps you can take to protect yourself. Prepare your vehicle. 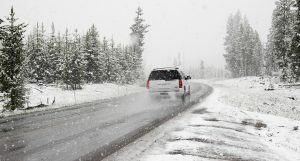 Ideally, your vehicle should already be prepared for winter weather. This means checking to make sure your tires are properly inflated and have enough tread depth. You should also check your fluid levels (coolant, oil and antifreeze) and the condition of your brakes. In addition, you could use several auto products that are made for winter weather conditions, such as snow tires. Drive cautiously. Keep in mind, your vehicle will take a longer time to come to a stop when winter road conditions are present. You should avoid following other motorists too closely. Never speed during winter weather conditions. Finally, you should avoid all types of distractions, not just your mobile phone. Eating, talking to other passengers or messing with the radio are also dangerous activities while driving on rain, sleet or ice. Wear your seatbelt. Should the worst occur, and you are involved in an accident, you should give yourself the best chance to avoid injuries or death. Seatbelts considerably reduce the risk of deaths and injuries during car accidents. You should also make sure that your passengers are buckled up. Receiving a ticket should be the least of your worries for not wearing a seatbelt. Do not use cruise control. You should never use cruise control during winter weather conditions. Be prepared to carefully adjust your speed at all times. Cruise control can make it far more dangerous to come to a stop or avoid hazards. With sleet and ice on the roads, hard stops can prove fatal. Stay informed. You should try to avoid driving during heavy storms or when the roads are unsafe due to icing or sleet. Keep a close eye on weather reports. You can do this very easily with mobile phone apps, such as those offered by The Weather Channel or AccuWeather. Virtually all mobile operating systems come with built-in weather apps. Bring supplies. Your vehicle should contain an ice scraper, jumper cables, warm clothing, blankets, water, a first-aid kid and a mobile phone with a charger – at a minimum. This is especially true if you are gearing up to embark on a long drive. You should also know what to do after being involved in a car accident. If you are really unlucky, the accident will cause injuries that keep you from being able to enjoy your life. An attorney can help you determine if it is possible to secure compensation that can help pay for costs that are commonly associated with auto accidents. Our Northeast Pennsylvania personal injury law firm offers free consultations. You can reach us by calling (570)258-8820 or by using our online case review form.